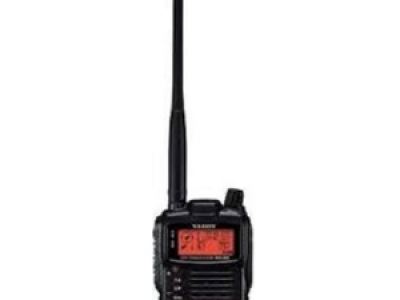 Yaesu VX-8GR adalah HT dengan fitur sangat canggih dan frekwensi yang sangat lebar. Dirancang untuk pengoperasian di luar ruangan, teknologi tinggi serta mudah dalam pengoperasian. Dengan tombol utama besar dan empat tombol kunci yang tahan lama, Yaesu VX 8GR juga memungkinkan pengoperasian yang mudah bahkan ketika mengenakan sarung tangan. Full 5 watts FM 144/430 MHz. GPS unit included with radio! Water spray resistant - meets IPX5 - 3 feet for minimum of 30 minutes. 7.4 V 1100 mAh Lithium Ion battery included. 1800 mAh LI Battery & 3 x AA battery case optional. Weather receiving with Weather Alert. Dot matrix LCD display provides up to 16 character Memory tags, High-resolution Spectrum Analyzer with ±50 channels indication, Wave monitoring of received/modulated signal. DCS and CTCSS ENC/DEC included. APRS® 1200/9600 bps data communication (B band only). Smart Beaconing ™ Function: When using APRS® for position tracking, the beacon timing is automatically adjusted to your traveling speed and location to plot a smoother trace to match your position and movement on a map. The number of Station List memories increased to 50. The number of APRS Message memories increased to 30. DIGI-PATH route indication function: The APRS® Packet data includes Digipeater routing info. Heads up compass display to the GPS Screen: Traveling direction is always toward top of the display. The Message received LED flashing rate is selectable. The number of DIGI-PATH route settings is increased to 7.